Libyan boxer and reigning WBF International Light Heavyweight Champion Malik ‘‘The Trigger’’ Zinad will be fighting the Ugandan and Dutch-based Farouk Daku on 7th October in London in defence of his title. 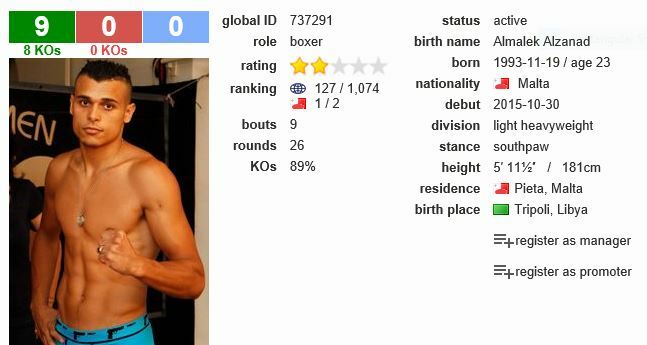 Zinad has a professional record of 9 wins out of 9, 8 of which he won by knockout. Zinad (which is the Arabic for trigger) hails from the Salah al Deen area of Tripoli and made his professional debut in October 2015. He became WBF International Light Heavyweight Champion in September last year by beating Attila Palko by a technical knockout (TKO) in Maribor, Slovenia. 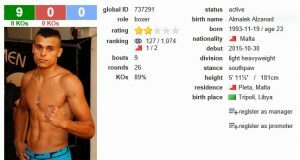 Speaking to Libya Herald 23-year old Zinad said that he started boxing when he was ‘‘five years old. My father taught me. I have been a professional fighter for two years now. I have won all my fights’’. Zinad was forced to leave Libya as an 18-year old in 2013 to escape the troubles there after the 2011 revolution in order to further his career and dreams. 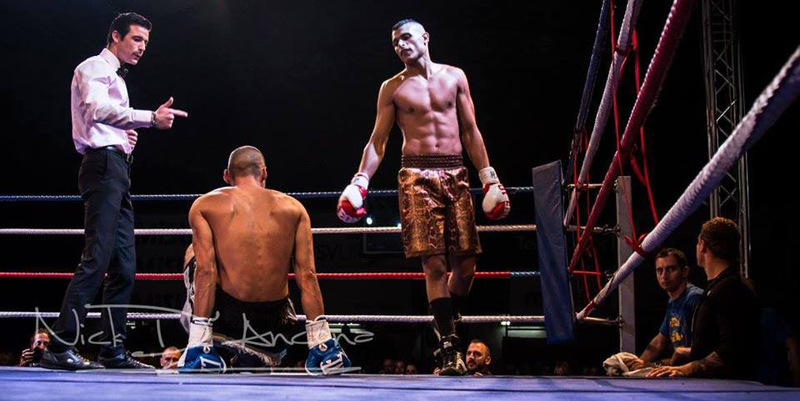 ‘‘I came to Malta 3 years ago for my boxing in order to be the best fighter’’, he explained. His last big win was in May this year when he beat Jermaine Asare by knockout in the first round in Cardiff, Wales defending his WBF Light Heavyweight title. In March, he won another fight by TKO against Aleksander Kuvac in Malta. In December last year he successfully defended his title with a knockout against Georgian Beka Aduashvil in Bielefeld Germany. It will be recalled that boxing was banned as a sport by Qaddafi in Libya and Zinad initially started training as a kickboxer. His dad was a former boxer who used to train him in the basement of their home. There is much excitement about Zinad in the boxing world in view of his numerous victories by knockouts – dispatching boxers with much more experience than him. He is also fortunate to be trained by Canadian Danny Lalonde, a former Light Heavyweight boxing champion himself.